Tiny organisms have been discovered thriving deep underneath a site in the US where an asteroid crashed some 35 million years ago, underscoring the fact that asteroid impact craters may be the best place to look for signs of life on other planets, according to a new study from scientists from the University of Edinburgh. The team drilled almost two kilometers below one of the largest asteroid impact craters on Earth, in Chesapeake, U.S. Samples from below ground showed that microbes are unevenly spread throughout the rock, suggesting that the environment is continuing to settle 35 million years after impact. Scientists believe that the organisms are evidence that such craters provide refuge for microbes, sheltering them from the effects of the changing seasons and events such as global warming or ice ages. By extension, crater sites on Mars may also be hiding life, and drilling beneath them could lead to evidence of similar life forms. Scientists say that heat from the impact of an asteroid collision would kill everything at the surface, but fractures to rocks deep below would enable water and nutrients to flow in and support life. Some organisms grow by absorbing elements such as iron from rock. 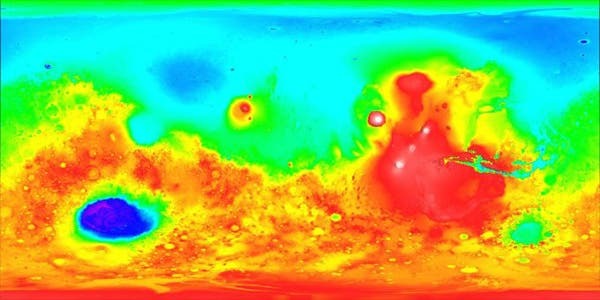 "The deeply fractured areas around impact craters can provide a safe haven in which microbes can flourish for long periods of time," said Charles Cockell, of the University of Edinburgh's School of Physics and Astronomy. "Our findings suggest that the subsurface of craters on Mars might be a promising place to search for evidence of life." The map of Mars at top of the page shows the extreme contrasts in elevations on the planet. At 27 kilometers high, Olympus Mons and the high volcanic peaks (the white peaks slightly right of center in the image) stand in stark contract to the lowest regions (in purple). One of the most noticeable features on the map is the Hellas Planitia basin, which shows up as a large, round spot in the lower left quadrant. Likely the result of an asteroid impact, Hellas Planitia is about 2100 kilometers across making it one of the largest impact features in the Solar System.